Esan Street foods dominate the Menu at KROK, a Thai spot on Brooklyn's Columbia Street. 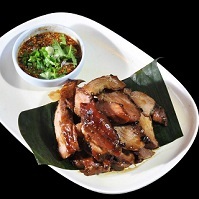 Look for dishes like Moo Num Tok, a spicy mix of grilled pork, fish sauce, lime and chili powder (cold beer is recommended). There is Neua Dad Deaw, a sundried beef jerky served with a tamarind chili dip; and Pla Meauk Bod, grilled dried squid with a peanut plum sauce. 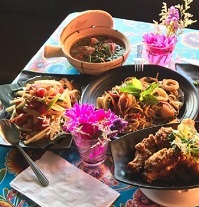 There is much to explore on the menu at KROK including more than half a dozen different types of green papaya salad, Thai soups and curries, as well as whole fish cooked with Thai spices. Desserts include pumpkin custard with coconut milk on top.